Spurs boss Harry Redknapp says Davies (right) is a "proper centre forward"
Whatever your view of Kevin Davies, one thing is for sure: opinion on the Bolton captain is divided. Is he a dirty player or a just a striker who represents some of the more English aspects of football that many fans yearn for? It is a debate which is often illustrated by facts quoted on more than one occasion by various managers and even a referee, according to former Bolton boss Gary Megson. During four of the last six seasons in which Davies has played for the Trotters, he has topped the list of fouls committed in the Premier League. In the other two seasons he was second. That has led to opposition managers, including Arsene Wenger and Sir Alex Ferguson, firing off pre-match warnings to referees asking for their players to be protected from Davies' supposed rough-arm tactics. Indeed, it has come to a point where those protestations have crept into the game itself, says the 32-year old. "Some managers will say to their players 'if he comes in on you scream around a bit, you'll get him booked or sent off'," Davies told BBC Sport. "They know that if you get a yellow card then you cannot play the same way. It's happened a few times to me last season, you'll get managers stomping to see the referee. "If I've made a tackle the whole bench will get up, it leaves the referee with no choice really. It's a bit out of order, a bit unsportsmanlike." It's hard not to think that an obvious way to eradicate the problem would be not commit the fouls in the first place, but that may be easier said than done given Bolton's reputation for getting the ball forward quickly. 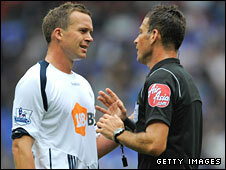 Davies often spearheads the Bolton attack and a result picks up what he calls "niggly" fouls. That is also backed up by statistics which present him as one of the most fouled players in the league and one who has been shown a red card just once in the last six years. But away from the figures and listening to those that have played with and against him, Davies has earned a reputation as a player who is as committed, and as fair, as they come. In fact, it could be argued that beneath the hyperbole from the likes of Wenger and Ferguson lies a sliver of admiration for a forward who represents an old-fashioned threat to their defences. Manchester United defender Rio Ferdinand has been on record as saying Davies is among his toughest opponents, and last October Tottenham boss Harry Redknapp said: "He's a proper centre-forward. He's excellent, he just knows how to play." Those who watch him on a regular basis are equally as effusive. Gareth Robinson, chairman of the Bolton Wanderers Supporter Association, told BBC Sport: "He's very committed to the cause and he gives 100% to everything that he does. That is probably part of his undoing really, but he is not dirty at all. "He does a lot of the things that centre-forwards don't do these days like defend from the front line. When the ball is passed across to the full-back he'll chase across to tackle them and sometimes, whether it's his age catching up with him or not I don't know, he might arrive a bit late." Even the custodians of the game have a good relationship with Davies, the Sheffield-born player says. "I get on with the referees all right but then after 10 minutes I'll be booked," he said. "I don't think I make that many bad tackles, an awful lot of them are a bit niggly. "The game has gone now, you can't make a mistimed tackle without getting booked, it's just ridiculous. I would imagine that in a few years slide tackles will be outlawed. "I'm not a dirty player and I never go out to hurt anyone. Physically I'm quite strong and I like to play in the right manner, but there are a lot of softies playing now who scream around." Redknapp's claim last season came after Davies scored 12 goals making it his most prolific for Bolton. Indeed his form even led to him making two England preliminary squads, with some supporters vouching for him to replace Emile Heskey. But having seen younger players overtake him in the pecking order, that dream has now faded, Davies admits. No matter. A year after he was made captain by Megson, he says he now feels "better than ever" and following Owen Coyle's appointment earlier this month, the former Chesterfield player will join his team-mates on Saturday in facing the team he supported as a boy. The FA Cup fourth-round tie against Sheffield United gives Davies a chance to reflect on being released by the Blades as a schoolboy. But any thoughts of what might have been are eclipsed by a competition which set him on his path to the Premier League. "I always believed Sheffield United thought highly of me when I was about 13 or 14, but then I had a dip in form for a few months and I was told at 15 that I wasn't being taken on," he said. "It was probably a blessing in disguise for my career because I went and had trials with Chesterfield and three or four months after that I was playing in the first team. "Looking back to my Sheffield Boys side there were a lot of good players who were signing for the likes of Aston Villa and Manchester United but I was one of the last to sign and there is only probably me and Luke Beckett [now at Gainsborough Trinity] who have actually played professional football since then." The choice to join Chesterfield paid dividends when the Spireites went on an amazing run to the FA Cup semi-finals in 1997 when they were eventually beaten in a replay by Premier League Middlesbrough. The then Division Two team came as close as they could to Wembley in the first game, drawing 3-3 at Old Trafford with a last-gasp equaliser, but they were undone by a disallowed goal which looked like it went over the line. Despite the draw, which was celebrated like a victory anyway, Davies did enough during the Cup run to secure a transfer the following summer to Premier League Southampton for £750,000. "To get to the semi-finals that year was unbelievable," he said. "We had a couple of good draws but we turned some good sides over. 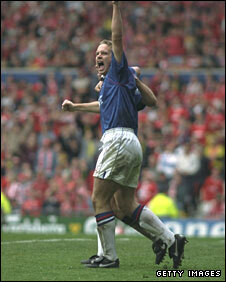 "In the semi-final when we were 2-0 up you think you're there don't you? But a bit of controversial refereeing cost us in my view and we ended up losing in the replay but I still look back at it as a great experience." Davies says he sees no reason why his current club cannot replicate that sort of run, particularly as he heads a rejuvenated squad under new boss Coyle. "I'm not sure whether I'll be playing this Saturday or what the manager's attitude is to the FA Cup, but I'm sure we'll want to field a good side and want to get through to the next round because it's a good draw for us and a good opportunity," he said. Do you think Davies is a dirty player or an old-fashioned centre-forward you would like in your team? "It will be a tough game but if we are professional and do the right stuff then hopefully we'll get through. A couple of the big boys have gone out [of the FA Cup] so you start to wonder if you could do it. "There are a lot of lads who are desperate to play, having been out of favour, so it will be a good side whatever team he selects." Having been handed the captaincy a year ago, Davies says he is enjoying leading from the front and is relishing the challenge of ensuring Bolton's Premier League survival. It all comes from an appreciation of knowing that he might not get too many chances to replicate those heady days at Chesterfield or indeed when he scored for Bolton in the 2004 League Cup final. So if supporters or detractors are expecting him to curb his old-fashioned enthusiasm as he approaches 33, then they are clearly mistaken. "As you get a bit older you appreciate each game you play in," he said. "You want to keep playing for as long as you can because when you speak to players who don't play any more they miss it. So I'm really enjoying it as much as I ever have. "I'm the captain and I'm one of the ones who has to get the boys going, roll the sleeves up and get on with the battle. "And anyway," he says, "I'm too old to start changing now!"